My potato plant died this week, so I harvested the potatoes. This was actually a sport from the year before, but if it really wanted to grow who am I not to water it? I ended up with five small potatoes. These were not enough to make a dish by themselves, so I would have to add them to something. Minestrone is a classic Italian soup that has no set ingredients. The name translates as “thick vegetable soup.” Whatever is in season is what goes into the pot. Modern versions usually include tomatoes, beans, pasta, and meat as well. In addition to these, I am using the potatoes, a bit of leftover frozen chicken bits, some cabbage and spinach. This is a good soup to clean out your vegetable bin of things that are not enough to use otherwise. I have some frozen pearl onions, a few green beans, an heirloom carrot, and half s of red and a green bell peppers. Not one of these is enough to make a dish, but all together they have possibilities. I will also add celery and garlic, a can of fire roasted tomatoes, a can of Cannellini beans and 32 ounces of chicken broth. Toss in a few herbs and some pasta into the mix and everything is set to simmer. I am sure the girls would be happy if I stopped right here, but I crave meat. Last time I made this soup with chicken. Today, I am taking a half pound of mild Italian sausage and making meatballs to add to the soup. Those who want more vegetables may leave the meat in the pot. Note: You may make this dish Vegan by leaving out the meats and using vegetable broth. 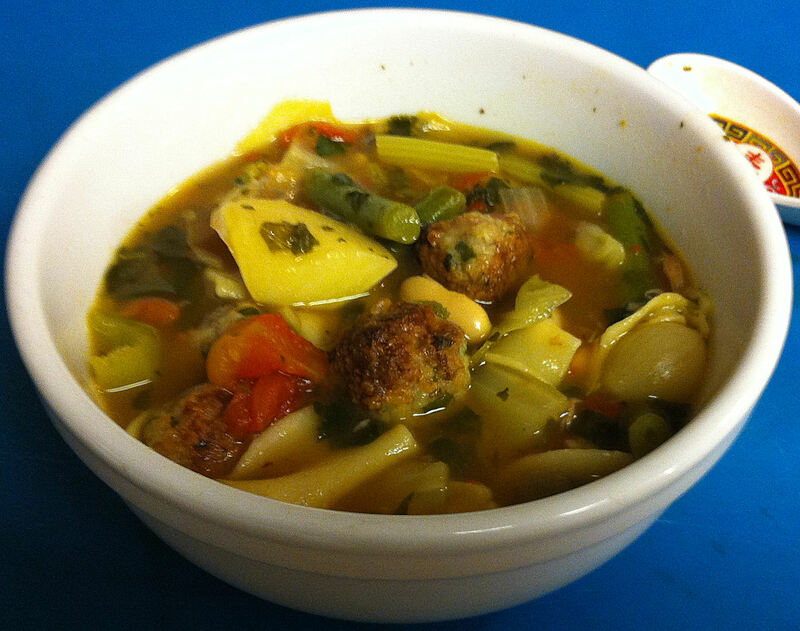 Italian-American chef Angelo Pellegrini argued that a good minestrone required starting with a borlotti bean broth to be authentic. When you make the meatballs, do not simply take the Italian sausage and roll it into balls. You will end up with hard little rocks that will leave most of their flavor in a pool of grease in the roasting pan. Pouring this grease into your soup will only leave you with a scum of oil floating on top of your soup. Take the time to lighten up the meat into more of a meatloaf. 1. Spread the chicken bits in a single layer in a shallow baking pan and broil on high for 10 minutes. Turn the bits over and broil 10-15 minutes more, until golden brown. Tip: Whenever I cut up a whole chicken I am left with necks, wing tips, gizzards, etc. that I freeze for later use. When I have time, I brown and stew these bits to enhance canned broth. It may not be stock from scratch, but it helps. I used to brown these bits directly in the pot, but this was a hot, splattery, messy task guaranteed to leave you with burns. Browning in the oven is much easier and neater. Note: If you are short on time you may feel free to skip steps 1-3 and go with strait chicken broth. 2. Transfer the chicken bits to the pot and add the chicken broth and 2 cups of water. Simmer for 1½ hours. Tip: If the chicken juices in the baking pan did not burn, add a bit of hot water to deglaze the pan. Scrape the fond free and add it to the pot. 3. Strain the broth and set it aside. Cool the chicken bits and clean any meat from the bones and reserve it. Note: Many professional cooks would discard this meat, not me. 4. Put the Italian sausage in a small bowl and add 2 tablespoons of boiling water. Tip: The hot water warms the pork fat and makes it easier to mix in the other ingredients. 5. Add the onion, parsley, egg, and most of the bread crumbs and use your hand to thoroughly mix them into the meat. Tip: You want to add enough bread crumbs to make a fairly dry, thick mixture. This may need more or less than the ¾ of a cup of bread crumbs, depending on the size of the egg. Note: When we have a Deli Dinner (salads and olives from La Villa Italian delicatessen) we always buy a loaf of Ciabatta. Ciabatta goes hard very quickly, so I turn any that is left into bread crumbs with a box grater. These I store in the freezer, until I need them for Italian meatballs. 6. Wet your hands and use a half tablespoon measure to scoop up the meat. Roll the meat between your palms to make half inch balls and arrange them on a Pam-ed baking sheet. Tip: Standard meatballs are one tablespoon of meat, which make one inch diameter balls. I think these are a bit big and awkward to eat in a soup. 7. Broil the meatballs, two inches from the element on high, for 10-15 minutes, until they are well browned. Remove to a bowl and set aside for later. Tip: The balls are small enough that the bottoms brown from the heat of the pan. As a result you do not need to turn them half way through the cooking time. Very little of the flavorful grease is released during cooking, because the bread crumbs soak it up and keep it—and it’s flavor— inside the meatballs. Eilene discovered them and several meatballs did not make it into the soup. I would give her a hard time, but she was not the only one snacking on them—they were so good all on their own. 8. Clean the soup pot and put in the olive oil over medium high heat. 9. Add the yellow onions and sauté for three minutes. 10. Add the celery, carrot, and cabbage, Continue sautéing for three more minutes. 11. Pull the vegetables to the sides of the pot and add the garlic to the hole in the middle. Sauté the garlic one minute, until fragrant, and mix it into the vegetables. 12. Stir in the chicken broth, potatoes, and pearl onions. 13. Add the basil, oregano, rosemary, pepper, salt, and tomatoes. Bring the pot to a boil, reduce the heat and simmer, covered, for 15 minutes. Tip: I am using fresh herbs. I stripped the leaves from the stems and tied them into a paper tea bag. You can also use a piece of cheese cloth or a metal tea-bauble for this purpose. This allows you to have the herbal flavor without a lot of chewy bits of herbs floating around in your soup. Remove and discard the herb packet just before serving. 14. Stir in the meatballs, chicken bits, beans, green beans, spinach, and pasta. 15. Simmer, covered, for 10-15 more minutes. 16. Stir in most of the flat-leafed parsley and the peppers. Simmer for five minutes more. 17. Transfer the soup to individual bowls and garnish with the remaining parsley.